Visitors walking to Sandy Island need to be aware of the tides so they don’t become stranded at high tides. The park is only accessible by foot at a low tide of 8 feet or less. Sandy Island and the Seal Islets are part of White Spit, which extends out from Denman Island towards Courtenay. Use caution while boating, as many areas are not navigable due to shallow waters. Jáji7em and Kw’ulh Marine Park [a.k.a. Sandy Island Marine Park] includes Sandy Island – known locally as Tree Island – and the nearby Seal Islets. The park is located off the northern tip of Denman Island and is accessible by boat from Union Bay on Vancouver Island or by foot from Denman Island at low tide. This park has long been popular with Comox Valley residents, and is becoming a draw for visitors as well. Sandy Island offers good opportunities for bird watching and nature appreciation, as well as sandy beaches perfect for sunbathing and swimming. Sandy Island is a sensitive ecosystem of rare and fragile plants and animals. Numerous species of birds make their home on the islands and observing these can provide endless hours of enjoyment for photographers and nature lovers. Jáji7em and Kw’ulh Marine Park [a.k.a. Sandy Island Marine Park] is a sensitive ecosystem of rare and fragile plants and animals. While visiting the island please be respectful and help minimize any damage to the ground cover and the plants and animals that live there. FIRES ARE PROHIBITED in the park. Fire is a serious danger to this dry, sensitive and isolated park. Jáji7em and Kw’ulh Marine Park is located off the north tip of Denman Island. The park is located off the northern tip of Denman Island and is accessible by boat from Union Bay on Vancouver Island or by foot from Denman Island at low tide. Visitors walking to Sandy Island need to be aware of the tides so they don’t become stranded at high tides. The park is only accessible by foot at a low tide of 8 feet or less. Boaters can launch at Union Bay, directly west of the island. The closest communities are Denman Island, Union Bay, Courtenay and Comox Valley. History: Sandy Island was established as a provincial park in 1966. Prior to being a park, the island was used by the Department of National Defense for military exercises. Conservation: Over the past several years there has been an increase in the number of visitors to Jáji7em and Kw’ulh Marine Park [a.k.a. Sandy Island Marine Park] (known locally as Tree Island). Unfortunately, some of these visitors light fires, leave garbage, damage trees and plants and allow their dogs to run free, actions which are putting this small and fragile park at risk. BC Park’s mandate is to protect the natural woodlands, plants and animals but also maintain the recreational opportunities in the park. In order to meet our mandate and protect the park from damage by visitors, BC Parks has organized volunteer help. In a formal stewardship the Comox Valley Yacht Club and the Friends of Tree Island are assisting BC Parks in taking care of Sandy Island. As Marine Park Hosts, the yacht club members will anchor offshore to educate the visitors on appropriate park behavior. The Friends of Tree Island have produced an information brochure, are collecting data and assisting with the cleanup of the park. Park Rangers are available to coordinate the stewardship and patrol the island to educate and enforce the Park Act and regulations. Approved Master Plan [PDF] covers Fillongley, Tribune Bay, Helliwell, and Jáji7em and Kw’ulh Marine [a.k.a. Sandy Island Marine Park]s.
Visitors can access Sandy Island by canoe or kayak from Union Bay on Vancouver Island, or from Denman Island. Salt water fishing opportunities exist in this marine park. Fishing is permitted as per provincial and federal fishing regulations. All anglers should check the current regulations issued by Fisheries and Oceans Canada prior to fishing. Anyone fishing or angling in British Columbia must have an appropriate licence. 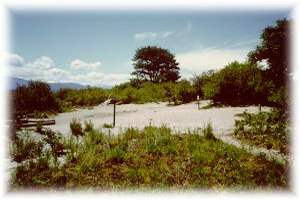 There are several easy walking trails through the park. Please avoid eroded areas and nesting sites. For your own safety and the preservation of the park, obey posted signs and keep to designated trails. Shortcutting trails destroys plant life and soil structure. Sandy Island Marine Provincial Park is open for waterfowl hunting only, in season. Hunters must have valid licences and tags. Please refer to the current BC Hunting and Trapping Regulations for information on closures and regulations. Pets/domestic animals must be on a leash at all times. You are responsible for their behaviour and must dispose of their excrement. This park offers ocean swimming with a rocky beach area; water can be quite cold. There are no lifeguards on duty at provincial parks. This park has 1 pit toilet, centrally located.